These are the first exercises you should do. These can be performed on the day after surgery. Repeat each exercise 10 times, aim for 4 times per day Start slowly and gently, and increase steadily. Bend your elbow and touch your shoulder with your hand. Then straighten your elbow completely. Support your elbow on a pillow. Keep your hand relaxed and your arm by your side then bend your wrist back and forth. Make a fist and squeeze slowly. And then gently open fingers out and relax. When comfortable with the Level 1 exercises, slowly move onto the Level 2. Keep pushing your hands together so that they support each other as you lift your arms over your head, reach within your comfort level. Lower your hands back towards you hips. Stand facing the wall with your toes about 20-25cm from the wall. 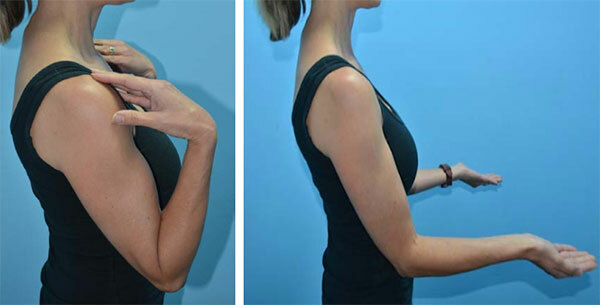 Place both hands on the wall about elbow height. Use your fingers to pull your hands up the wall, going as far as you can.